For Chicago Cubs fans there is now better place to spend a summer day than at the Friendly Confines; Wrigley Field is one of the most visited ball parks by fans of visiting teams and emits an energy of hope every spring. Steiner Sports and the Chicago Cubs is pleased to present this EXCLUSIVE offering for BigTimeBats, a very unique piece of this baseball shrine. 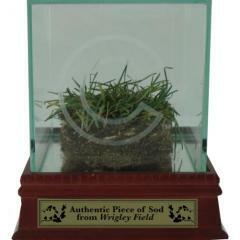 A piece of freeze-dried sod from Wrigley Field inside a handsome display case with beautiful wood base and laser etched plaque makes a wonderful addition to any sports fan's memorabilia collection. This special collectible is available ONLY through BigTimeBats so you must place your order now. Ron Santo, Ernie Banks, Fergie Jenkins, Ryne Sandberg, Billie Williams .... Tinkers to Evans to Chance ... Hack Wilson, these are just some of the game's legends who played on this beautiful natural grass surface over the years. There is no denying that Wrigley Field is indeed one of the most historic locations in sports. This is your chance to own a piece of history. This is your opportunity to own a piece of baseball history. Steiner Sports is one of the most respected dealers of sports memorabilia and each piece of sod comes with a Certificate of Authenticity. 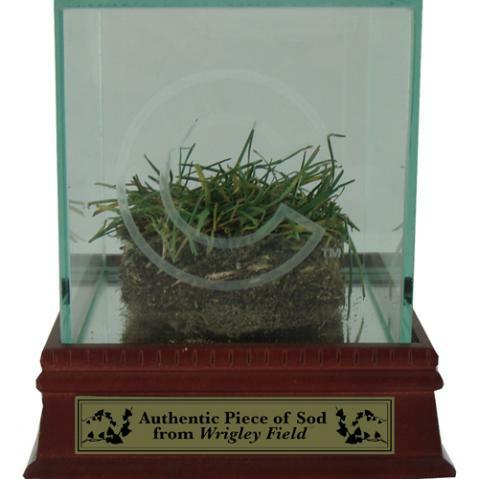 To ensure your Wrigley Field collectible is reserved we will charge your credit card for the full amount of this purchase. Orders are confirmed by Email. Please allow 4 to 6 weeks for delivery.